Heat oven to 350°F. Spray 36 mini muffin cups with cooking spray. Cut cookie dough into 36 slices. Roll each slice into a ball. Place 1 cookie dough ball in each mini muffin cup. Bake 15 to 20 minutes or until golden brown. Immediately press indentation into each with end of wooden spoon. Cool completely in pan, about 20 minutes. Run knife around edges of cups to loosen; gently remove from pan. Meanwhile, in medium bowl, stir together frosting and marshmallow creme. Spoon into small resealable food-storage plastic bag; seal bag. Cut 3/8-inch tip off bottom corner of bag. Insert tip of bag into indent in each cookie cup; squeeze bag to fill opening, about 2 teaspoons per cookie cup. 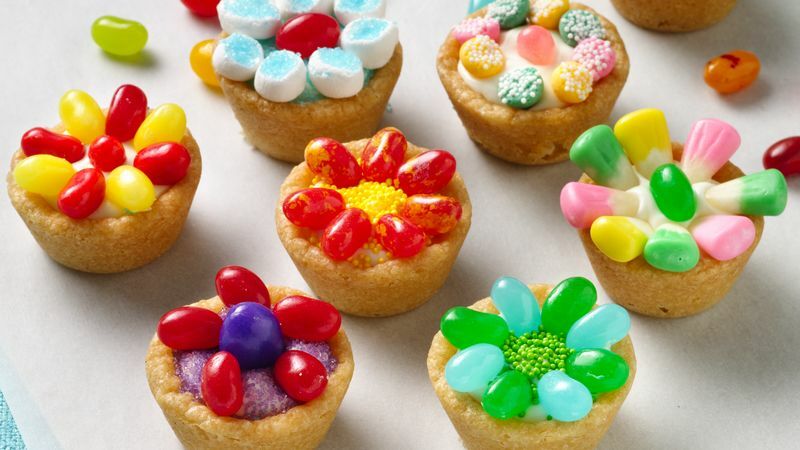 Decorate cookie cups with remaining ingredients, using photo as a guide. To do ahead, make cookie cups through step 2. Store covered up to two days at room temperature.